Sophomore John Narum used his yo-yo skills to wow America, receiving four “yeses” from the celebrity judges in his audition. 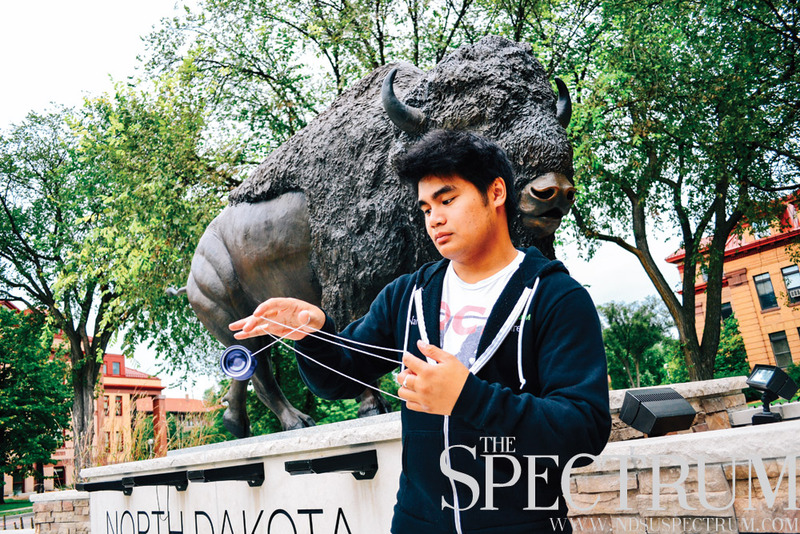 NDSU had already been introduced to the “Yo-Yo Extraordinaire” from his many campus performances and feature in the Dec. 12, 2013 issue of The Spectrum, but America got its chance to see the former 11-year-old world champion in action in season nine of NBC’s hit talent competition. Starring judges Howie Mandel, Mel B, Heidi Klum and Howard Stern, the TV show begins in search for America’s top talent acts with auditions in cities across the United States. Three “yeses” from the celebrity judges get the contestant a trip to the next round. But not many know the casting that takes place long before the shows air. That was around January when Narum went to Indiana to audition in front of a panel of producers, who passed him through to New Jersey and the first round of televised performances in front of the celebrity judges and a filled auditorium of around 4,000. Standing backstage, Narum could hear some of the acts performing before him and the boos of the audience or every buzzed “X” from the judges, making him a little more nervous. Narum flew out to New York City in June for a week and a half to film “Judgment Week,” the last stop before the live quarterfinals in Radio City Music Hall. During Judgment Week, Narum got the opportunity to talk with all four of the celebrity judges to meet them and see what he could do to make it to the next round. With a unique idea to present more of a modern, artistic element to his act, Narum put his yo-yos under UV light while performing in front of just the judges. After what he considered was a flawless performance, Narum was asked to come back in front of the judges, who ultimately decided that was the end of the road. “When I first got eliminated, I was pretty bummed, because I thought I had a performance that was good enough to go through, while some of the other acts had made mistakes,” Narum said. One of those acts that made it through was Juan Carlos, a Latino rollerblade dancer, who many believed did not deserve to make it to the next round, especially with other acts like Narum out of the competition. But Narum knew he is still in college and has a solid plan for his future as a manufacturing engineer. Some of his favorite experiences with “America’s Got Talent” are from the people involved in the show, from the acts to the judges to the host, Nick Cannon. “Nick Cannon is like a little kid,” said Narum jokingly. “He’s pretty much a normal person besides the fact that he had this big, hulking bodyguard following him everywhere. Narum still watches the show and thinks about the interactions he has had with the people remaining in the competition, for instance Jaycob Curlee, who was adopted coming from an abusive, neglectful home. Mike Super, who performed last year at NDSU Oct. 22, is a spiritual mind illusionist and Narum’s favorite contestant remaining in the competition.